I’m usually in 4 – 8 juried shows each year and at least a couple solo exhibitions. The list to the left was selected from many from the last 25 years. 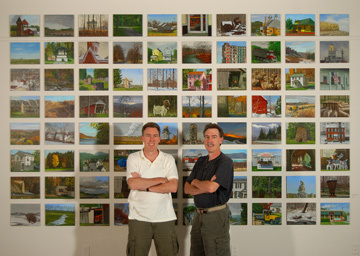 The University Museum at Indiana University of Pennsylvania featured my twin brother and me in our first “twin showing”. It was a great opportunity for us to show our work together at the university from which we graduated 30 years ago. His work as a graphic designer was on one side of the museum and I was on the other. The above photo was taken in front of “Homage to Indiana County”, the 80-painting installation that is installed in the Performing Arts Center at IUP.